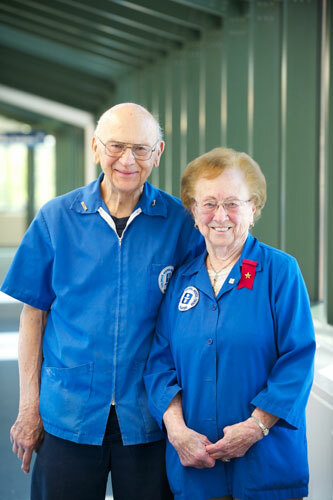 Volunteers of all ages are an essential part of the family at Akron Children’s Hospital, including our oldest volunteers, Rose Carlson, 96, and Stanley Wolczyk, 94. Rose and Stanley have given a combined total of 4,250 hours to the hospital, and continue to volunteer every week. Rose has been volunteering at Akron Children’s for eight years. On most Wednesdays, you can find her at the errand desk from noon to 4 p.m. Volunteers at the errand desk typically help the nursing staff. Nurses often can’t leave their station for lunch breaks, so Rose is happy to help. Rose says the people are nice and her favorite part about volunteering is that she feels like she’s helping others, and the hospital. Stanley began volunteering at Akron Children’s about 24 years ago. Before retiring, he was a principal at a couple different Norton schools. Stanley helps the maintenance crew during his volunteer shifts each week. Stanley loves meeting new people: patients, their families and all the employees at Akron Children’s Hospital and it’s not hard to see why. Stanley had stories and pictures that could have lasted for days. He even has a tree in Florida, named after him. “I love meeting all the good people here, especially all the kids,” said Wolczyk. Stanley has donated more than 3,500 hours of his time to Akron Children’s. To learn more about our volunteers, or to find out how to volunteer your time visit akronchildrens.org/volunteer.